How do you imagine Crown Hill Urban Village in twenty years? 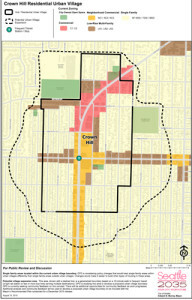 The Crown Hill Urban Village (CHUV) is essentially a new community which includes parts of Crown Hill, Whittier Heights, Loyal Heights, Olympic Manor and Greenwood. How do you imagine CHUV in twenty years? Our neighborhood is at a crossroads. The density and development coming to our community will change our homes, streets and lifestyle. We need to work together for policies that lead to a community with vibrant arterials lined with multi-family housing and small business, as well as the transit and infrastructure to support that growth. Or, we can let the City’s current proposal – a top-down blanket UPzoning of single-family homes without a plan for growth and without the infrastructure to support it – turn our neighborhood into a sprawling area of low-rise multi-family buildings and expensive town homes scattered between modest single-family bungalows, leaving development of our arterials to the whim of the developers. 1) Expedite developing a Comprehensive Neighborhood Plan for the CHUV – BEFORE REZONING. CHUV is slated for the largest upzone and expansion of existing Urban Villages in the city. We are being asked to bear the brunt of the City’s growth. 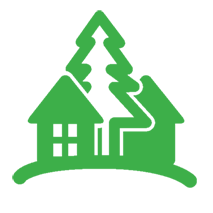 We believe that growth must be informed by planning before rezoning. We would like the City to lead a Comprehensive Neighborhood Plan to guide the City’s growth plans for the our neighborhood, including zoning analysis and updated, appropriate design guidelines. CHUV has not had a neighborhood plan since 1998, when we were included in a plan with Ballard. Our current zoning does not reflect the needs of a “walkable, residential urban village” and even includes specific, auto-oriented commercial zoning (Holman). Planning before upzoning will result in a more livable neighborhood for everyone. 2) Incentivize density on arterials (15th to 65th, Holman, 85th) and areas that are already zoned but underutilized. Incentivize smart development along arterials, including appropriate buffer zones and design standards to make the CHUV commercial center a walkable, livable, desirable urban center. Arterials have enormous capacity for expansion and growth, and the greatest ability to absorb additional density. Redevelop the big parking lots and one-story stores into vibrant multi-story, mixed-use commercial/residential housing and retail. Our neighborhood is slated for the largest UPzone of Single-Family Homes in the City. 3) Limit upzoning in Single Family zones, while simultaneously encouraging density along arterials. Displacement of existing low- and middle-income residents is a concern. We do not want to lose our neighbors to $700k town homes. Those who rent older apartments or single-family homes are at great risk of displacement when developers buy properties to re-develop. Additionally, we believe developers will build in neighborhoods rather than arterials, given the choice. Limiting growth in single-family incentivizes smarter growth along arterials. 4) Definitively tie infrastructure (sidewalks, utilities, schools, etc.) and transit to growth. We propose concurrency to link density to better infrastructure capacity. Transit infrastructure, in particular, needs significant investment to meet current as well as future demand. Much of CHUV lacks sidewalks, undermining basic pedestrian and bike safety and undermining the vision of a walkable community without dependence on cars. Additionally schools, utilities, and parks need investments to accommodate growth. 5) Encourage commercial spaces to be built and leased to support small, locally-owned businesses. We are concerned about displacement of local small businesses. Many new developments being built along arterials are forcing out small businesses, but not replace the commercial spaces being lost. We envision mixed-use residential/commercial development along arterials that support our small and locally owned business, and attract more of the businesses like coffee shops, small retail and office space that make a community truly livable and a vibrant urban center. How can you, as an individual, affect change? Help us get expand our email list by sharing our flyer with your neighbors. Encourage them to sign up for email updates from CHUV. We will be asking neighbors to reach out to elected officials from time to time, to show them the depth of our community engagement. There are two public hearings coming up that are very important. June 21, 9 AM City Hall and June 27th at City Hall. Come to the hearing and join us to sign up to comment. Email us at info@crownhillurbanvillage.org for help writing comments and let us know you are coming so we can meet you. We hope everyone potentially impacted by growth in our neighborhood—renters, landlords, businesses, and single family property owners will work with us to make Crown Hill Urban Village a more livable and vibrant community for us all. Thank you.